The Asia-Pacific Risk and Insurance Association (APRIA) invites you to submit a paper for presentation at its 18th annual conference in Moscow, Russia. The Faculty of Economics, Lomonosov Moscow State University, is the host of the conference. The Association welcomes theoretical or applied research papers on risk or insurance topics, including insurance law and regulation / supervision, insurance economics and finance, insurance practice and policy, social insurance, employee benefits, pensions, risk management, financial planning, international insurance issues and insurance education. 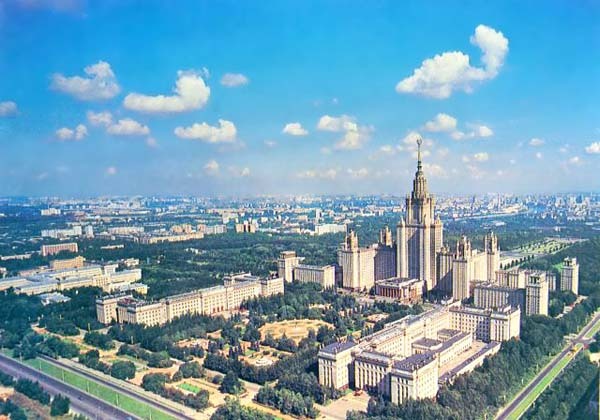 Moscow University campus is an extremely complex system, with its 1 700 000 m2 floor area in 1 000 buildings and structures, with its 8 dormitories housing over 15 000 students and 300 km of utility lines. The Faculty of Economics has been founded in 1941, but the tradition of university economic education covers more than 200 years. By the end of the XIX-th century there existed an entire system of economic subjects including the courses in political economy, the economics of industry, agriculture, trade, transport, credit and finance and others. The Faculty of Economics is very dynamic. Our challenging epoch witnessing the global transformation of Russian society brought about the need for a serious renovation of economic education and the MSU Faculty of Economics was one of the first to meet the challenge. Today the Faculty of Economics comprises 22 departments and more than 10 laboratories, and has more than 500 tutors and researchers, about 2,000 of full-time and part-time students, more than 400 graduates registered for Ph.D. One of the mentioned-above departments is Risk Management and Insurance department which shall be hosting 18th annual conference of APRIA in Moscow this year. The Faculty has a lot of supplementary structures such as pre-university courses, and short-term programs following the logic of non-stop education. Nevertheless, classical Bachelor's and Master's programs are in the focus of the Faculty's educational activity. Organizing Committee publishes presentations provided by the conference speakers. Igor Zhuk, Director of Insurance Market Department of the Central Bank of the Russian Federation. “Basic indicators of the insurance market in the Russian Federation, 2013”. Igor Yurgens, President, All-Russian Insurance Association. “Conditions and growth prospects of Russian insurance market”. Plenary session One: Insurance supervision. W. Jean Kwon, E.A.G. Manton Chair Professor and Director of the Center for the Study of Insurance Regulation, School of Risk Management, St. John’s University (US), "Developing issues in insurance regulation globally". Dr. Capitolina Tourbina, Director, Russia Representative office General Reinsurance AG A Berkshire Hathaway Company. "Challenges of the insurance Solvency regulation in the new insurance". Hongjoo Jung, Professor SKK University, Korea. "Insurance supervision of the Republic of Korea - always for financial consumers". Timur Gilyazov, Metlife, "Review of the reform of saving pension and non-state pension funds". Vladimir Novikov, President, Guild of Actuaries. "Actuarial profession and risk oriented regulation of financial markets". Andrey Kigim, Chairman, Social Insurance Fund of the Russian Federation. Social Insurance Fund of the Russian Federation- Strategic Development Guidelines. Dmitriy Talaev, Executive Director, Member of the Board, SOGAZ Insurance Group. "International cooperation: new horizons". Ilias Aliev vice-president LLC ROSGOSSTRAKH, Evgeny Zlobin director, Interaction with Educational Institutions. The system of education and science in Insurance in Russia. Dmitriy Popov, Chairman of RAMI Committee, First Vice-President Allianz IC (Russia). "Regulation of insurance rates for compulsory insurance classes". Edvard Grebenshchikov, Editor of "Finance" Magazine. "Eurasian and East Asian Insurance space. Channels and Instruments of Harmonisation of Regulations and Integration of the Markets". Special lecture, Yehuda Kahane (Tel Aviv University, Israel). “Insurance and the new economy”. SOGAZ Insurance Group is one of the biggest universal insurance companies in Russia and takes the lead on the market of corporate insurance. SOGAZ offers over 130 types of compulsory and voluntary insurance. Key clients of the Group are companies that form the backbone of the Russian economy in various industries: fuel and energy, chemistry, metallurgy, aerospace, machine building, transport, cargo, construction etc. The company’s regional network includes more than 600 divisions all over Russia. The Group also works on the markets of Germany and Serbia. The reliability of SOGAZ has been confirmed by independent market analysts and experts. SOGAZ has been assigned reliability rating A++ by Expert RA, as well as international financial stability ratings «B++» (A.M. BEST) and «BB+» (Fitch Ratings), outlook Stable. The Group is in cooperation with reinsurance companies of impeccable reputation such as Munich Re, Swiss Re, Hannover Re, SCOR, Lloyds of London, and others. The Group’s own capital as well as collaboration with the world leaders in reinsurance allows SOGAZ to provide compensation for losses of any extent fulfilling its commitments to the clients. The Russian Association of Motor Insurers (RAMI), a non-commercial organisation, is a professional association covering the whole of Russia to which all insurance companies that are licensed to carry on Compulsory Motor Third Party Liability Insurance (CMTPL) are obliged to belong. making compensation payments to road accident victims in accordance with RAMI’s inception documents and the CMTPL Insurance Law. ROSGOSSTRAKH is the largest nationwide insurance company in Russia with over 90 years of experience behind it. Today it operates in all regions of Russian Federation. ROSGOSSTRAKH has 83 branches and more than 3500 agencies, sales and claims-handling offices. ROSGOSSTRAKH delivers its services to more than 43 mln individual and over 240.000 corporate clients. Following companies work under the brand ROSGOSSTRAKH: Rosgosstrakh Ltd., OJSC Rosgosstrakh, Rosgosstrakh-Life and Rosgosstrakh-Medicine. RGS Pension fund provides retirement benefits for its’ members. The company employs 100 000 well trained, professional staff, including more than 65 000 insurance agents. ROSGOSSTRAKH BANK is a universal commercial bank, ranked among Russia’s top 50 leading credit organizations. Its main activities are SME lending and providing financial services to individuals. The Bank is a member of the compulsory deposit insurance system. Bank was established on September 5th, 1994. The client base of ROSGOSSTRAKH BANK includes over 30 000 corporate clients and over 1.5 million individuals. The Bank offers products and services to its clients in all federal districts of Russia. The Moscow Convention Bureau is the city’s official representative in the international meetings’ industry. Accumulating information on Moscow’s convention and exhibition opportunities, it promotes the Russian capital as a prominent international meetings’ destination and attract important and promising events. Legal organizational form: Autonomous, non-commercial organization Established by Moscow City Government represented by the Department of Science, Industrial Policy and Entrepreneurship.